In Italian, antipasto literally means "before the meal." This recipe, served with a side of tasty stuffed mushrooms, is hearty enough to replace the meal! Directions for salad: In Italian, antipasto literally means "before the meal." This recipe, served with a side of tasty stuffed mushrooms, is hearty enough to replace the meal! Directions for mushrooms: Preheat oven to 350. Remove the stems from the Cremini mushrooms and fill each mushroom with approximately 1/2 tablespoon of yogurt. Wrap each mushroom with a half slice of turkey bacon and secure with a toothpick. Top each mushroom with a dash of Italian seasoning and garlic salt, bake for 10-12 minutes. 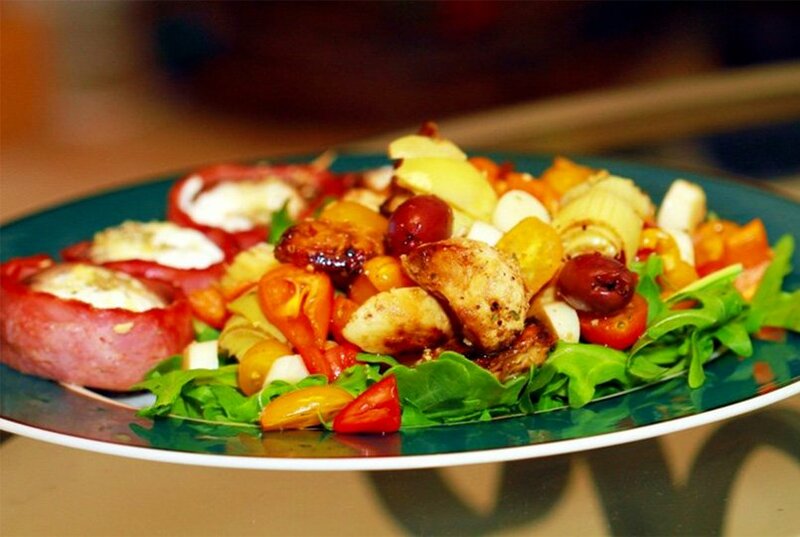 Serve immediately with antipasto salad.